Catherine Delahunty is a former Green MP. Of the many things I learned as an MP the most disturbing was about a Pacific neighbour in serious trouble without powerful political allies. I also learned what a flag can mean to a people and the price they can pay for it. Every December 1 in three cities across Aotearoa small groups of people gather to raise a flag known as the "Morning Star". This flag is the symbol of freedom for the country of West Papua, which is a close Melanesian neighbour many people have never heard of. Many of us have visited parts of Polynesia and have some idea life there is not just a tourist brochure, but few of us know much about West Papua. Until I became an MP and met some Papuans I had no idea this Melanesian neighbour was suffering regular human rights abuses as an occupied territory behind a media blackout. 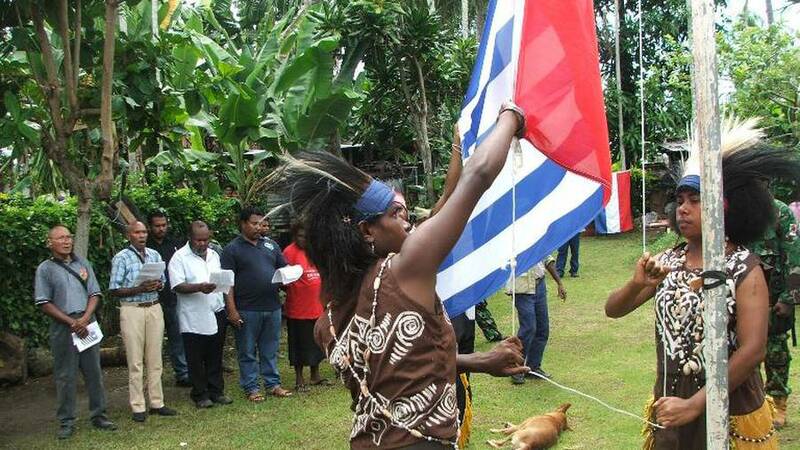 The "Morning Star"' flag is banned by Indonesia but is the symbol of the Papuan struggle for freedom which has been sustained since the United Nations allowed a fake referendum in 1969 to hand the country over to the Indonesians so that resources could be extracted. Papuans who raise this flag can face up to 15 years in prison or worse from the violent military units and police forces that target "rebels". The tragic abuses at Manus Island have highlighted the plight of international refugees in camps in Papua New Guinea but the refugee camps of West Papuans on the PNG border remain unknown and locked in an equally hopeless limbo. They fled a regime that to date has received no serious challenge from the Australian or New Zealand governments. The endless series of extra judicial killings and human rights abuses are barely reported. Recent increased military activity to protect the disastrous but profitable Freeport McMoRan gold and copper mines has included the disappearance of yet another political leader. The silence of the international community on these events is deafening. A petition signed by 1.8 million people, mainly West Papuans, taking considerable personal risks was recently presented to the UN decolonisation committee calling for an independently supervised referendum of indigenous West Papuans for their self-determination, but again barely a ripple or a response from this supposed bastion of human rights. A few New Zealand media deserve commendation for being willing to report on the issues. The New Zealand Herald published a great article on West Papua in 2014 written by a NZ journalist who went under cover and exposed how our country's community policing aid programme in West Papua was viewed by Papuans as "aid that kills". This led to Indonesia stopping the programme for reasons never explained. Radio New Zealand International has always led the field on detailed and thorough reporting of West Papua news and Māori Television have been committed, but the rest of the mainstream media cannot take a bow. In Parliament I set up a cross-party group to support West Papuan self-determination and independence. However governments to date have refused to challenge Indonesia about the self-determination issues. Trade was always more important than uncomfortable discussion on behalf of a voiceless nation experiencing occupation by a violent military and a massive influx of Javanese migrants. The new Parliament presents a opportunity to review policy towards West Papua. It could be the opportunity to show regional leadership and mediate for peace and justice. Melanesian countries and the couple of Polynesian countries already supporting West Papua would welcome a signal that New Zealand was willing to reconsider our role. It is not just that we feed our dairy cows on the palm kernel from palm plantations where Papuan rainforest once stood, or that our kwila decking is imported at the expense of forest communities. It is the horrific photographs of state violence and torture which the cellphones transmit from the highland villages and towns of West Papua. The new Government could continue a proud Kiwi tradition which was exemplified during the Bougainville peace process and the East Timor recovery, by breaking the silence on what has happened to the Papuans since 1969. The Government will need the encouragement of the public which is hard to generate given the media barriers maintained by Indonesia. The rights of the voiceless do rely on the momentum of media, politicians and citizens in countries where a range of flags can be flown without violent retribution. When the "Morning Star" is flown today it will be with the hope we are ready to be good neighbours and once again be a small nation whose moral compass is strong enough to help expose and to heal the hidden shame in our backyard.